Black 2 and White 2 Other Pages: Pokédex Completion Awards | You need more just a piece of Poképaper! What's that Jimmy? You've got yourself a shiny Pokédex? Have you caught them all yet? No?! Well.. have you seen them all? Not even that?! How about just the first.. oh, you're just setting off on your journey to become the greatest trainer of all time? Ah, then it might be a good idea to make you aware of some little goals to aim for! 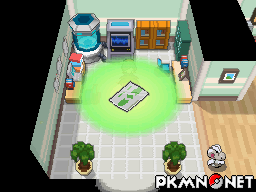 New to Pokémon Black 2 and White 2, there are a few rewards that you will receive if you meet certain criterias with your Pokédex that will have an effect and an impact on your game, as opposed to the old certificates which were given out and only really useful back with the GameBoy Printer..
See all Pokémon in the Unova Dex! If you have seen all of the Pokémon in the new Unova dex, upon showing your Pokédex to Professor Juniper she will exclaim, offering you a reward for your efforts. This reward will be the special License which allows you entry into the Nature Preserve. Here you will not just find rare Pokémon, but a Shiny Haxorus will be stood awaiting your challenge. Capture all Pokémon in the Unova Dex! If you have managed to capture all of the Pokémon in the Unova dex, upon showing your completed Pokédex to Professor Juniper she will exclaim, offering you a reward for your efforts. This reward wll be the special item Oval Charm, a mysterious and somewhat unbelieveable charm that when held will make it easier for the Daycard Man to find eggs. A fine reward for the breeder in you. Capture all Pokémon in the National Dex! If you've managed to capture all Pokémon in the National Pokédex, with the exception of Event legendary Pokémon such as Mew, Celebi and Keldeo, upon showing your finally complete Pokédex to Cedric Juniper, he will remark and tell you to approach his daughter who will have a reward for your efforts. This reward will be the special and rare Shiny Charm, a mysterious shining charm that when held will make it easier to encounter Shiny Pokémon. The Shiny Charm, when in your bag, increases the likelihood that you will encounter Shiny Pokémon. The chances of encountering Shiny Pokémon in the wild are increased by nearly 3.5 times, making it a 1 in 2,370 chance of encountering a Shiny Wild Pokémon, or hatching a Shiny Pokémon, as opposed to the normal rate of 1 in approximately 8192. If, however, you're using the Masuda Method to breed, it increases it to 1 in 1,024 from 1 in 1,365.